The natural sweetness of parsnips works well in this creamy mash, which matches the duck perfectly. Cut the parsnips and potatoes into small chunks and place in a large saucepan. Cover with cold water, bring to the boil and simmer gently until tender. Meanwhile, put the garlic, butter and cream in a small saucepan and heat gently until the butter melts. Drain the potatoes and parsnips, and return to the pan. 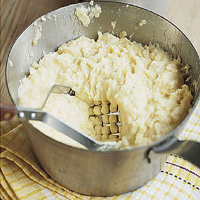 Add the garlic, butter and cream mixture, then mash with a potato masher until smooth and creamy. Season generously. This recipe was first published in March 2007.